​​​​The Buffalo Bills' hopes that Super Bowl XXVII would be third time lucky were dashed before halftime, as they trailed the upstart youth movement of the Dallas Cowboys, 28-10, and faced the rest of the game without their starting signal caller, Jim Kelly, who was knocked from the game early in the first half. The Bills had actually taken the lead first as Thurman Thomas rumbled over the goal line 2 yards out for an early 7-0 lead. 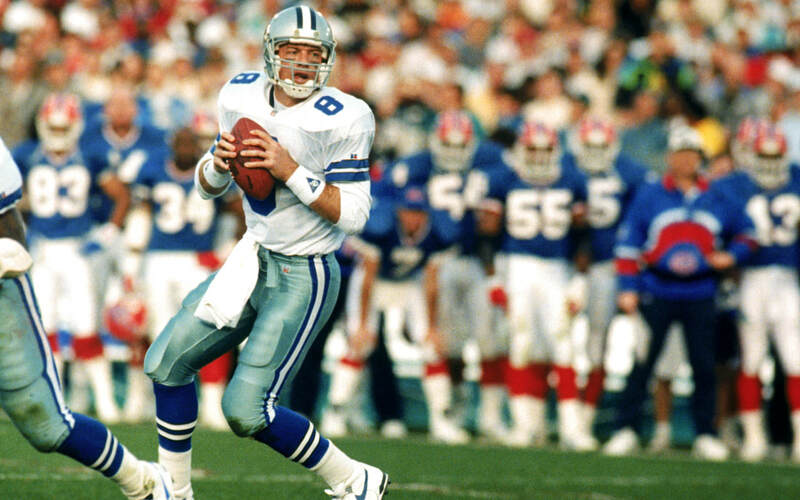 Dallas answered with a Troy Aikman touchdown pass to tight end, Jay Novacek, levelling the score, 7-7. The following score not only gave the Cowboys the lead (one they would not relinquish), but also, momentum. 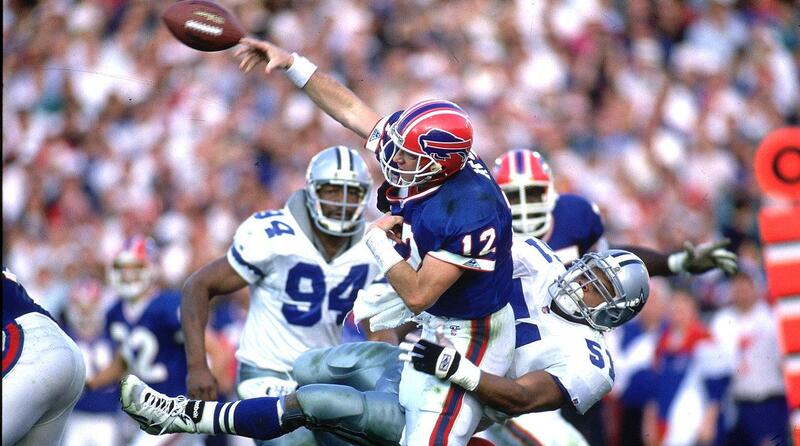 Sacking the Bills' quarterback, Jim Kelly, the Dallas defense knocked the ball loose in the process. Defensive lineman, Jimmie Jones, scooped the ball up and took a large stride into the end zone for the score. Entering the final period still only two touchdowns back, the Bills completely came undone, allowing a flurry of 21 points to run the final score to 52-17. Quarterback, Troy Aikman, who completed 22 out of 30 pass attempts for 273 yards and threw 4 touchdown strikes, was voted the contest's MVP. 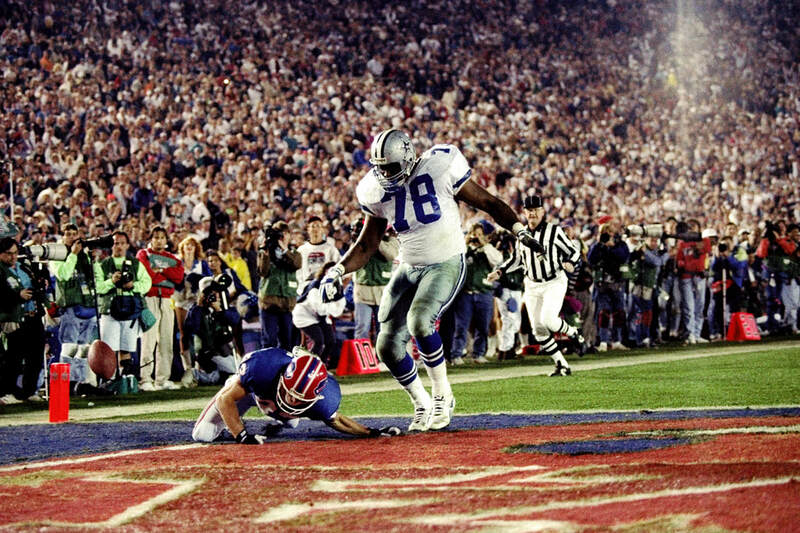 The Buffalo Bills became the first (and only) team to lose three consecutive Super Bowls with their drubbing at the hands of the Cowboys. They would of course extend this record the following season by falling to the Cowboys again in Super Bowl XXVIII. 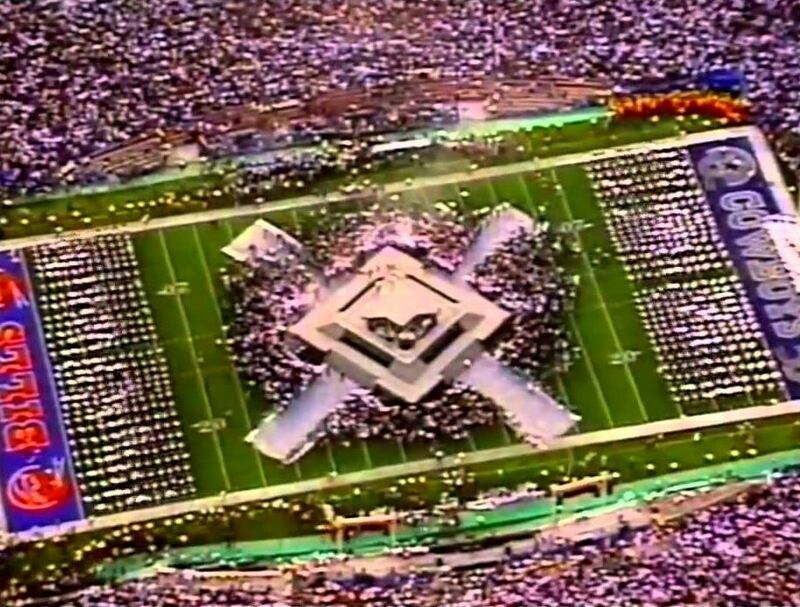 The halftime show featured arguably the biggest name (at the time) to ever grace a Super Bowl stage when Michael Jackson performed in front of the Super Bowl XXVII crowd. You can see several videos about this performance at the end of this article. Jackson's performance, incidentally, began the tradition of using "big A-list" names from the rock and pop world for the Super Bowl halftime shows. One of the most re-watched plays of the game would prove to be the Cowboys' Leon Lett's fumble return for a score - that wasn't. Having scooped up the ball and returning it all the way to the goal line, Lett held the ball out low (in the style of his offensive teammate, Michael Irvin). Bills' receiver, who had been pursuing Lett, knocked the ball free, resulting in a touch-back for Buffalo. 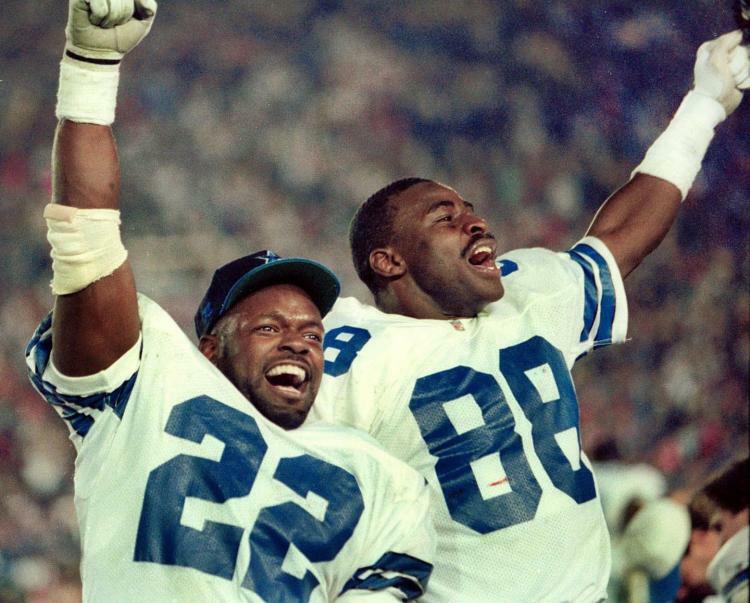 Had Lett score the touchdown, it would have given the Cowboys the record for most points in a Super Bowl with 59. 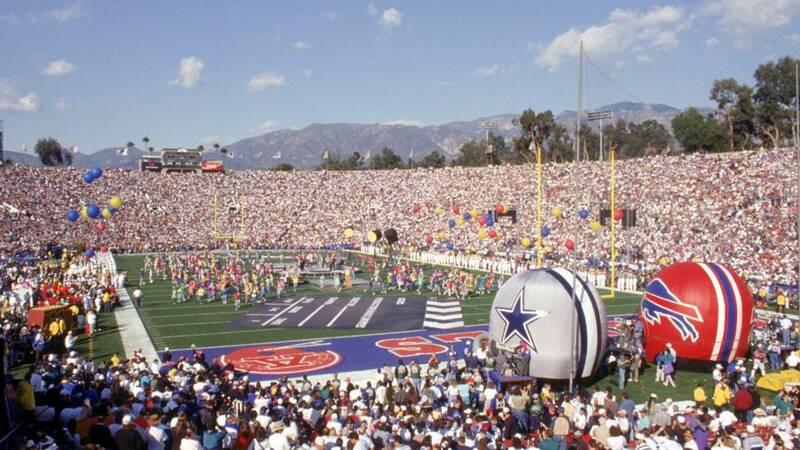 Said to be the Super Bowl match-up "nobody in America wanted", the Dallas Cowboys and the Buffalo Bills faced off for the second straight year, under the roof of the Georgia Dome in Atlanta.